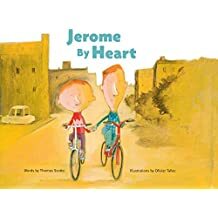 In Thomas Scotto’s Jerome by Heart words are paired with Olivier Tallec‘s sweet illustrations to tell a story of prepubescent love. The next spread shows the boys on a class trip. A long line of children reacts to a painting, but the boys are not present. Instead, on the facing page, Jerome and Raphael stand together in front of a different painting. The text reads: “On field trips to the art museum,/ It’s me he chooses as his buddy./ That’s why I love Jerome./ It doesn’t bother me at all./ Raphael loves Jerome. I can say it./ It’s easy.” The proclamation of love does not necessarily queer the boys’ relationship, but the fact that the narrator disavows shame and stigma, claiming prototypical gay pride, inserts queer possibility into the narrative – these boys are not “just” friends. In scene after scene the boys are shown in proximity and clear affinity, delighting in one another. In one two-page image Jerome is seen on a soccer field ignoring the game and instead chasing butterflies. Raphael stands next to him, hands clenched at chest-level, eyes closed, smile wide, enjoying Jerome’s happiness. On the facing page Raphael’s father sits on a bench watching two girls aggressively chase a ball. The text reads: “My dad thinks it’s a “pity”/ that Jerome doesn’t play soccer./ But just because Jerome doesn’t play rough/ doesn’t mean he’s not strong./ He is strong.” The term strength is resignified in the text; it is not about physical strength and prowess but instead one’s ability to know and perform desire. The narrator/protagonist’s unrelenting praise of Jerome gestures towards the potential queerness of all childhood intimacies. Another two-page image, washed in cheery yellow, shows the boys playing together, laughing together, running together, talking together, and holding hands. The accompanying text reads: “I’ve made up my mind./ From now on, every day is for Jerome./ Mornings are happy from the start!/ By lunch, we’ve laughed so hard our stomach hurts./ And by dinner, I’ve stocked up on enough of Jerome to last me the whole night./ That’s important.” Rafael counts time by his love for Jerome and has dedicated everyday to him. Of course, the straight world infiltrates the text; Raphael’s world is inhabited by people other than Jerome, and his parents respond poorly to his infatuation. They monitor and judge Raphael’s behavior, although they do not articulate their discomfort and judgment in words; much is felt through the absence of eye contact and physical proximity. Raphael’s father refuses to see Raphael, instead looking at his shoelaces, when his son mentions Jerome. Even more, his father seeks to silence him, foreclosing conversation about his son’s desire. This is weak, even though his father is physically big and strong; he’s no Jerome. The dark blue color wash that sets the tone in the breakfast scene is continued in the next illustration, this one of Raphael alone in his bedroom. His room is full of toys, but he does not play with any of them. Instead he stands, one hand quizzically resting on his chin as he tries to understand his parents’ reaction. The future is not given to the reader, but not knowing what will happen next does not detract from the real joy and desire experienced in the text’s present; which is the gift it gives us. Originally published in French, Jerome by Heart, which makes childhood desire thinkable, speakable, is a must have on every bookshelf. Of course, children experience infatuation, often same-gender infatuation, and this text gives voice to it beautifully. After several close readings I am crushing on Jerome; he ALWAYS chooses Rafael, and that’s quite lovely.